This manuscript describes a tube formation assay to quantify the effects of a given compound or condition on angiogenesis by using endothelial cell tube formation in a controlled environment. Xie, D., Ju, D., Speyer, C., Gorski, D., Kosir, M. A. 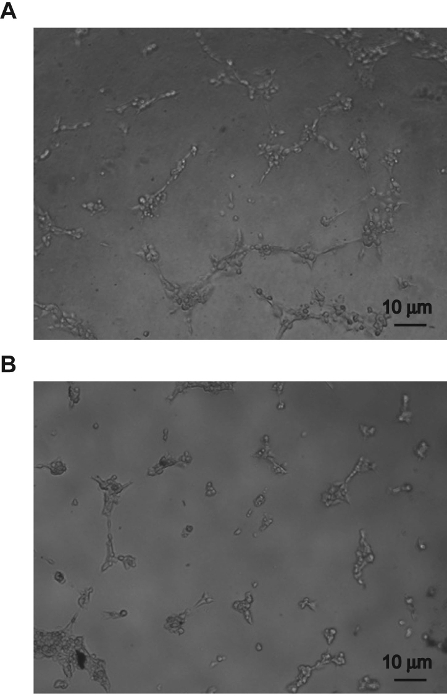 Strategic Endothelial Cell Tube Formation Assay: Comparing Extracellular Matrix and Growth Factor Reduced Extracellular Matrix. J. Vis. Exp. (114), e54074, doi:10.3791/54074 (2016). Malignant tumors require a blood supply in order to survive and spread. These tumors obtain their needed blood from the patient's blood stream by hijacking the process of angiogenesis, in which new blood vessels are formed from existing blood vessels. The CXCR2 (chemokine (C-X-C motif) receptor 2) receptor is a transmembrane G-protein-linked molecule found in many cells that is closely associated with angiogenesis1. Specific blockade of the CXCR2 receptor inhibits angiogenesis, as measured by several assays such as the endothelial tube formation assay. The tube formation assay is useful for studying angiogenesis because it is an excellent method of studying the effects that any given compound or environmental condition may have on angiogenesis. It is a simple and quick in vitro assay that generates quantifiable data and requires relatively few components. Unlike in vivo assays, it does not require animals and can be carried out in less than two days. This protocol describes a variation of the extracellular matrix supporting endothelial tube formation assay, which tests the CXCR2 receptor. In order to obtain the nutrients necessary for survival, malignant tumors require access to the patient's blood stream. To get that access, tumor cells release chemical signals that stimulate the growth of new blood vessels to the tumor, thus hijacking the normal physiologic process known as angiogenesis2. It is also through the blood vessels created via angiogenesis that metastasis (i.e., the spread of cancer to other organs) can occur. Because the process of angiogenesis is so vital to the progression of such a wide variety of cancers, it is an attractive target in anticancer therapy research3. One method used to quantify angiogenesis is to measure the endothelial progenitor cell's ability to form tubes when placed on an extracellular matrix. Because formation of these tubes is a critical early step in angiogenesis, testing environmental conditions (e.g., presence or lack of a given compound) that can stimulate or inhibit tube formation provides insight into specific steps that can be targeted to inhibit angiogenesis. The endothelial cell tube formation assay is one of the most widely used4 in vitro methods that measures the cells' ability to form tubes. It is a simple assay, requiring relatively few components and a short culture period5. Perhaps most importantly, however, is that the data gained from this type of assay is quantifiable. An example for the use of the tube formation assay involves comparing the development of tubes from vascular endothelial cells grown on extracellular matrix vs. growth factor reduced (GFR) extracellular matrix. The extracellular matrix is a basement membrane-like material isolated from sarcoma cells and its main components are laminin, type IV collagen, growth factors and proteoglycans. Some compounds have different effects on the cell's ability to form tubes when in an environment with reduced growth factors and reduced heparan sulfate proteoglycans (HSPGs). HSPGs are a component of the extracellular matrix which is significantly reduced in GFR extracellular matrix. As an example, if the hypothesis is that angiogenesis inhibitors, such as SB225002, which blocks the CXCR2 receptor, have considerably weaker ability to interrupt tube formation when HSPGs are abundant, then a comparison between tube formation activity in extracellular matrix and GFR extracellular matrix is important in exploring the possibility of angiogenesis inhibition via the control of HSPGs. Other assays that are commonly used to determine the effects of compounds on angiogenesis are in vivo methods. Notable examples of this are the chick chorioallantoic membrane (CAM) assay6 using chicken eggs, and the in vivo Matrigel plug angiogenesis assay7 using mice. While in vivo methods measure angiogenesis in three dimensions and are more representative of the human body compared to the in vitro tube formation assay, they suffer the flaw of requiring significantly more time and are considerably more difficult to perform. Both the CAM assay and the extracellular plug assay take at least a week8 to do, while in comparison, the tube formation assay can be done in a single day and it does not require animal usage. It is important to note that the endothelial cells used in this report are human umbilical vein endothelial cells (HUVEC). These cells play a key role in vascular sprout and growth of blood vessels, and are sufficiently analogous to endothelial cells in cancers to be used to evaluate anti-angiogenesis activity in both in vitro and in vivo experiments9. Other cells such as primary microvascular endothelial cells may also be used. It is also important to note that besides having lower levels of HSPGs, the GFR extracellular matrix also has reduced levels of many components when compared to normal extracellular matrix. This includes, but is not limited to: EGF, IGF-1, PDGF, and TGF-beta. Those performing experiments studying the significance of these compounds in relation to angiogenesis may be interested in using GFR extracellular matrix. Seed 3x105 HUVEC cells in 10 ml of complete growth medium10 in a 75 cm flask. Incubate cells at 37 °C in 5% CO2 to 70-80% confluence. Thaw either the growth factor-reduced (GFR) extracellular matrix or normal extracellular matrix overnight on ice at 4 °C. Note: For the sake of brevity 'extracellular matrix' will henceforth be used to reference both GFR and normal extracellular matrix. The process to prepare them is identical. Keep 96-well culture plates on ice, and add 50 µl of chilled extracellular matrix per well using pre-cooled tips. Prepare triplicate of 5 wells containing only the normal extracellular matrix. Prepare another triplicate of 5 wells containing only GFR extracellular matrix. Incubate the 96-well plate at 37 °C for 30 min. Wash the HUVECs once with phosphate-buffered solution without calcium and magnesium (PBS), and add 1 ml 0.05% trypsin-EDTA. Incubate the dish at 37 °C for 1-5 min, checking the cells every minute until most cells round up. Dislodge the cells by tapping the flask once. Add 5 ml basal medium (i.e., endothelial cell growth medium without anything (e.g., supplements) added) with 1% Fetal Bovine Serum (FBS). Collect the cells in the flask by pipetting and transfer to a 15 ml tube. Centrifuge the cells at 200 x g for 5 min and discard the supernatant. Re-suspend with 2 ml basal medium, count the cells using a hemocytometer, and adjust the cell concentration to 2-3 x 105 cells/ml. Prepare 100 µl of the following 10x concentrations of CXCR2 inhibitor SB225002 in basal medium: 11 µM, 5.6 µM, 1.1 µM, 0.56 µM and 0 µM (control). Pipette 300 µl of the HUVEC suspension into each 5 microcentrifuge tubes. Add 33 µl of the inhibitor concentrations (11 µM, 5.6 µM, 1.1 µM, 0.56 µM and 0 µM) into one tube each containing the HUVECs, and vortex. Pipette 50 µl of each of the cell suspensions (1-1.5 x 104 cells) to individual wells of extracellular matrix. Plate each suspension in triplicate and incubate for 4-16 hr at 37 °C, 5% CO2. After 4-16 hr, take 4 pictures of the tubes formed per well using an inverted microscope camera11 (original magnification x 100). Prepare the extracellular matrix and plates according to the same specifications as the Tube Formation Assay (steps 2.1 to 2.3). Prepare HUVEC suspension as described in Steps 2.4- 2.4.2 of the Tube Formation Assay and aliquot into a 96-well plate containing the extracellular matrix at 50 µl per well. Note: Plate enough wells so that there are 3 wells per drug treatment. Grow cells on extracellular matrix for 4 hr at 37 °C, 5% CO2. Take images before the initiation of drug treatment. Prepare 2x concentrations of the CXCR2 inhibitor SB225002 as described in Step 2.5 of the Tube Formation assay, and add 50 µl of each concentration per well of the 96 well plate containing the HUVECs. Plate each concentration in triplicate. Incubate the plate for another 2-12 hr at 37 °C, 5% CO2. Take 4 images of the tubes formed in each well using an inverted microscope camera (original magnification × 100) 11. Evaluate tube formation captured in the images by measuring the total tube length of tubes in four random microscopic fields using the microscope camera software. Open the image in the microscope camera software, and click 'Annotations and Measurements'. Under the 'length' section, select the 'simple line' tool. Click on the image, then draw a line along the length of the tube, then right click. Note: The software will automatically calculate the length of the line in pixels and put the data into a file. Repeat the procedure for all the tube lines in the image by selecting the 'simple line' tool. Click on the image, then draw a line along the length of the tube, then right click. Note: The software will record the length of each line and display the data on the screen. After measuring every tube in the picture, click 'Export', then chose 'Length to spreadsheet'. Note: The length data will be exported to a spreadsheet. Add all of the tube lengths from the spreadsheet to get the total tube length. Calculate and record the average length of the tubes. Note: Four replicates are recommended with mean and standard deviation determined. Culture and perform a tube formation assay (see section 2) on a larger scale as a 96 well plate will not yield sufficient cell count. For 12 well plates, use 500 µl of extracellular matrix and 500 µl of the HUVEC cell suspension (1.5x105 cells). Incubate the cells for 4-16 hr in order to form tubes. Then, aspirate the cell culture medium. Rinse the cells with 1 ml of cold 1x PBS without calcium and magnesium. Add 1 ml of ice cold PBS-2.5 mM EDTA buffer onto the culture and keep on ice for 10 min. Dislodge the cells and extracellular matrix mixture from the dish using a 1,000 µl pipette tip with tip cut off, and then transfer to a cold 15 ml tube, wash the well with 4 ml of ice cold PBS-2.5 mM EDTA and put into the tube. Put the tubes on ice for 1-4 hr and invert the tube a few times until all of the extracellular matrix is dissolved. Re-suspend the cell pellets with 1 ml cold PBS to a 1.ml tube on ice. Centrifuge again for 5 min at 3,000 x g at 0 °C, then dispose of the supernatant. Store the cells in -80 °C. Considerable, healthy endothelial tube formation can easily be contrasted to inhibited tube formation in the microscopy images. Healthy tube formation appears as an organized web of the capillary-like structures (Figure 1). In comparison, inhibited tube formation manifests itself as scattered cells (Figure 2). Tube formation assay data is quantified by measuring the total tube length of capillary tubes (Table 1). Besides total tube length, the average tube length, total number of tubes, or total number of branch points can be measured. Structured tube formation yields greater net tube length than scattered inhibited tube growth. 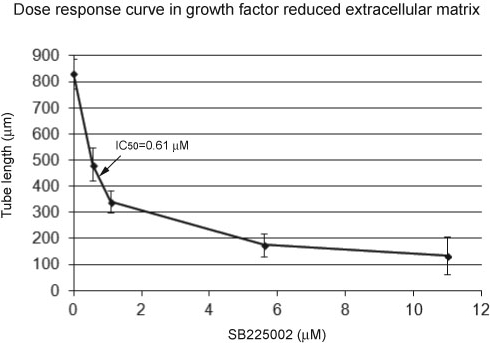 In Figure 3, a dose response curve permits calculation of IC50 under the experimental conditions of HUVECs on GFR extracellular matrix and a CXCR2 inhibitor SB225002. Figure 1. Endothelial tube formation on extracellular matrix and growth factor-reduced (GFR) extracellular matrix. 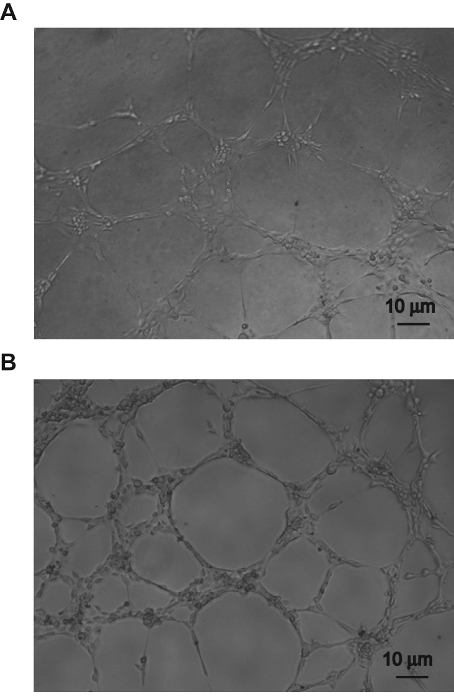 Two images show successful tube formation on extracellular matrix (A) and GFR extracellular matrix (B). The interconnected network of tubes clearly shows that the growth of tubes is healthy in these HUVECs. Scale bar = 10 µm. Please click here to view a larger version of this figure. Figure 2. Inhibition of tube formation on extracellular and growth factor-reduced (GFR) extracellular matrix by a CXCR2 inhibitor SB225002 (5.6 µM). Two images show tube formation that has been inhibited by a CXCR2 inhibitor SB225002 (5.6 µM) on extracellular matrix (A) and GFR extracellular matrix (B). The isolated clumps of HUVEC cells seen in this image show that the cells were not able to form the tubes necessary to connect to each other. Scale bar = 10 µm. Please click here to view a larger version of this figure. Figure 3. Dose response curve on growth factor-reduced (GFR) extracellular matrix. The X-axis shows tube length and the Y-axis shows the concentration of a CXCR2 inhibitor. The dose response curve shows that the HUVEC response to the CXCR2 inhibitor on GFR extracellular matrix is dose dependent. The IC50 (half maximal inhibitory concentration) was calculated by using software13 and can be compared with a dose response curve for extracellular matrix, for example. IC50 is the concentration of the inhibitor that decreases the response to 50%. Error bars represent standard deviation. Like all procedures, there are some disadvantages to conducting the endothelial cell tube formation assay. One major problem is that, because there are different types of endothelial cells and support matrices, the results of the assay can vary greatly depending on which type of cell and matrix is used. The endothelial cells used (HUVECs, HAECs or HMVECs) are primary cells, they are costly to get and have variability compared to immortalized cells. The primary cells have limited passages for use, and are therefore not suitable for long term angiogenesis experiments14. For reliable data, one should always use the same types for the assay. As with other in vitro assays, the results of a tube formation assay should be confirmed in vivo, because results from the controlled and artificial conditions of two-dimensional tissue culture may not always be reflected in the complex biosystem of a living organism. It is also important to keep in mind that this type of assay can only be used to demonstrate endothelial cell tube formation, and should not be used to test other, non-endothelial, tube forming cells. This assay is a rather simple and quick method to quantify angiogenic potential of a compound. It also forms a platform for further experiments, as alone, it does not yield information regarding the specific mechanism by which the compound actually affects the vessel forming process. However, the use of varied extracellular matrices is an example of how to further create a framework for research questions which is not commonly used. There are approaches to study the specific bio-chemical mechanisms of the compound including specific inhibitors that target components of the angiogenesis pathway. Another approach may be to extract RNA from the endothelial cells and use RT-PCR (Real Time PCR)12 to analyze alterations of gene expression which may cause the growth behavior observed in the assay. Future applications of this method include transfected HUVECs to create knock-down assays for specific steps of the angiogenesis pathway. There is potential to apply this approach to study the lymphangiogenesis pathway. By altering the extracellular matrix components, the interaction of matrix and cellular process supporting angiogenesis in cancer can be further elucidated. The extraction of RNA and proteins from endothelial cells under these specific conditions provide additional quantifiable data corresponding to imaging data. The work was funded by the Fund for Medical Research and Education, Wayne State University, Detroit, MI. EGM-2 complete growth medium (EGM-2 bullet kit CC-3162 ) Fisher NC9525043 HUVEC complete growth medium: EGM-2 base medium mixed with BBE (Bovine Brain Extract), hEGF (Human Epidermal Growth Factor), Hydrocortisone, GA-1000 (Gentamicin, Amphotericin-B), 2% FBS (Fetal Bovine Serum), VEGF (Vascular Endothelial Growth Factor), hFGF-β (Human Fibroblast Growth Factor Beta), R3-IGF-1 (Long R Insulin-like Growth Factor One), Ascorbic Acid, and Heparin. Aliquot the medium and its components and store them at -20 °C, warm in 37 °C before use. MATRIGEL MATRIX 10ML Growth Factor Reduced (GFR); 10 ml; LDEV-Free Fisher CB-40230 Growth Factor Reduced (GFR) extracellular matrix, keep in -20 °C, warm in 4 °C before use. MATRIGEL MATRIX 10ML; 10 ml; LDEV-Free Fisher CB-40234 extracellular matrix, keep in -20 °C, warm in 4 °C before use. SB225002 Fisher 559405 CXCR2 inhibitor, keep in -20 °C, warm in room temperature before use. Primary human umbilical vein endothelial cells (HUVEC) ScienCell Research Laboratories 8000 culture it according reference 10. Trypsin 0.05%-EDTA phenol red Invitrogen 25300-054 keep in 4 °C, warm in 37 °C before use. Nikon ECLIPSE Ti Nikon Inverted Research Microscope. Graph-pad Prism 5 GraphPad Software, Inc. scientific 2D graphing and statistics software, to calculate IC50. Sharma, B., Nawandar, D. M., Nannuru, K. C., Varney, M. L., Singh, R. K. Targeting CXCR2 enhances chemotherapeutic response, inhibits mammary tumor growth, angiogenesis, and lung metastasis. Mol Cancer Ther. 12, (5), 799-808 (2013). Birbrair, A., et al. Type-2 pericytes participate in normal and tumoral angiogenesis. Am J Physiol Cell Physiol. 307, (1), 25-38 (2014). Ferrara, N., Kerbel, R. S. Angiogenesis as a therapeutic target. Nature. 438, (7070), 967-974 (2005). Speyer, C. L., Hachem, A. H., Assi, A. A., Johnson, J. S., DeVries, J. A., Gorski, D. H. Metabotropic glutamate receptor-1 as a novel target for the antiangiogenic treatment of breast cancer. PLoS One. 9, (3), 88830 (2014). Gu, X., et al. Human Apurinic/Apyrimidinic Endonuclease siRNA Inhibits the Angiogenesis Induced by X-Ray Irradiation in Lung Cancer Cells. International Journal of Medical Sciences. 10, (7), 870-882 (2013). Manjunathan, R., Ragunathan, M. Chicken chorioallantoic membrane as a reliable model to evaluate osteosarcoma-an experimental approach using SaOS2 cell line. Biol Proced Online. 17, 10 (2015). Nidhyanandan, S., Boreddy, T. S., Chandrasekhar, K. B., Reddy, N. D., Kulkarni, N. M., Narayanan, S. Phosphodiesterase inhibitor, pentoxifylline enhances anticancer activity of histone deacetylase inhibitor, MS-275 in human breast cancer in vitro and in vivo. Eur J Pharmacol. 764, 508-519 (2015). Li, Y., et al. Copper improves the anti-angiogenic activity of disulfiram through the EGFR/src/VEGF pathway in gliomas. Cancer Lett. Aug. (2015). Park, H. J., Zhang, Y., Georgescu, S. P., Johnson, K. L., Kong, D., Galper, J. B. Human umbilical vein endothelial cells and human dermal microvascular endothelial cells offer new insights into the relationship between lipid metabolism and angiogenesis. Stem Cell Rev. 2, (2), 93-102 (2006). Clonetics Endothelial Cell System Technical Information & Instructions. Lonza Walkersville, Inc. Available from: http://bio.lonza.com/uploads/tx_mwaxmarketingmaterial/Lonza_ManualsProductInstructions_Instructions__Technical_Info_-_Endothelial_Cell_Systems.pdf (2015). The Essence of Cutting-edge Microscopy Research. Nikon Corporation. Available from: http://www.nikoninstruments.com/images/stories/PDFs/Eclipse_Ti_Brochure.pdf (2008). de Wit, C., Fautz, C., Xu, Y. Real-time quantitative PCR for retrovirus-like particle quantification in CHO cell culture. Biologicals. 28, (3), 137-148 (2000). 50% of what? How exactly are IC50 and EC50 defined. Graphpad Software. Available from: http://www.graphpad.com/support/faqid/1356/ (2015). Jaffe, E. A., Nachman, R. L., Becker, C. G., Minick, C. R. Culture of human endothelial cells for derived from umbililcal veins. Identification by morphologic and immunologic criteria. J Clin Invest. 52, (11), 2745-2756 (1973).